That notion runs counter to our current social media saturation – indeed to this very blog – yet it was Michael Ondaatje’s message for aspiring writers. Speaking at the University of Utah on Wednesday, the internationally-acclaimed author impressed upon his audience the need to start small: small projects with small presses and publications. This allows an author to experiment with form and genre (like Ondaatje) and discover an individual voice without being subjected to scrutiny too soon. Ondaatje continues to start small in his writing, beginning with a single scene and finding his characters and his story through his first of many handwritten drafts. 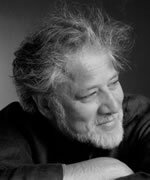 It is a lengthy process of discovery, but for Ondaatje there is a “pleasure in rewriting that is magical.” He considers the best time in writing to be when the story is still a secret to be shared privately with his alpha readers, away from the discerning eyes of copy editors, critics, and his legion of fans. Ondaatje was gracious enough to make three public appearances during his trip to Salt Lake City, but he still appreciates those times when he can go unwatched. writes of an old scar. the size of a leech. brandishing a new Italian penknife. and blood spat onto her shirt. I bring little to that scene. and divide us from present friends. the widening rise of surprise. is a medallion of no emotion. that never occurred between us. This entry was posted on April 1, 2011 at 8:58 am and is filed under Events, Poetry, Quote of the Day with tags Michael Ondaatje, National Poetry Month, The Dainty Monsters, The Time Around Scars. You can follow any responses to this entry through the RSS 2.0 feed. You can leave a response, or trackback from your own site.